Velarde II is a modern and elegant apartment located in Arenal neighborhood, in the center of Seville. The apartment is totally renovated. It is located on the first floor of the building. There are two bedrooms, one of them with two individual beds (size 0.90 x 1.90 m) and another one with a double bed (1.50 x 1.90m) and ensuite bathroom. There is also another separate full bathroom. At the end of the corridor you will find the living room, totally exterior with modern built-in kitchen. Everything has high quality design furniture to provide the maximum comfort. The apartment also has a small terrace/ balcony where you can enjoy the sunny weather of Seville. Velarde street is one of the prime locations after the center of Seville, as it is located next to the heart of Seville with easy access by car, taxi, walk etc. It is located just few meters away from the Real Maestranza, Torre del Oro, Cathedral, Alcazar Palace, etc. That is to say, it has a magnificent location to visit whole city. In this area you will easily find many local restaurants, tapas bars, small grocery stores, supermarkets and even the best Flamenco tablaos in the city! Located in the city centre and, at the same time, on the banks of Guadalquivir River, El Arenal quarter is one of the quarters of Seville with more Andalusian tradition. 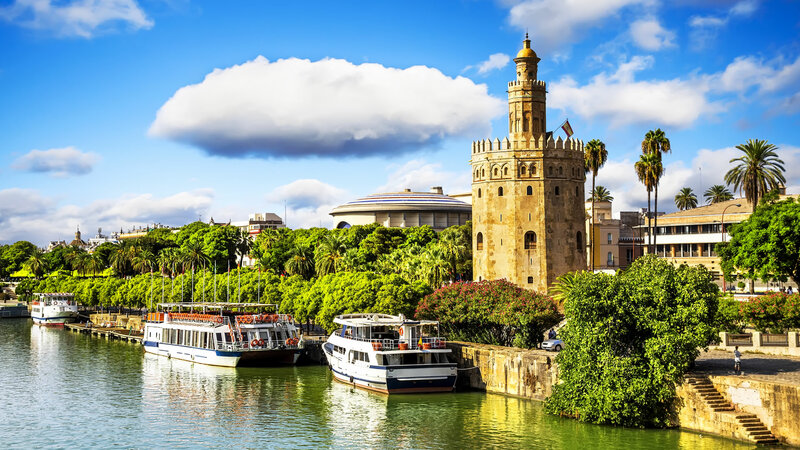 Since it can be found in the old part of the city, it has witnessed first-hand many events in Seville history, because of having had one of the most important ports in the world during the 16th and 17th centuries, thanks to the discovery of America and the resulting trade with India. El Arenal is, without a doubt, one of the most traditional and characteristic quarters in Seville. Furthermore, it is nowadays a busy and meeting place for people from Seville, since it is the quarter par excellence devoted to bullfighting, religious devotion, religious brotherhoods and Semana Santa (Holy Week) and these constitute the most significant features of this place. This zone is home to such symbolic buildings as the La Maestranza bullring, the Torre del Oro tower, the Arenal market, the Torre de la Plata tower and the La Maestranza theatre. In this zone you can enjoy leisure activities, mostly all the ones regarding the world of the Spanish bullfighting, opera, theatre and religious brotherhoods. While walking around this quarter, tourist can take the opportunity to get to know better part of the history of our city by visiting other places of touristic interest, namely La Hermandad de la Santa Caridad church or the Atarazanas (medieval shipyard). Finally, thanks to its central location, you will be able to find within a very short walking distance the Cathedral and the Giralda tower, must-see places if you come to spend a few days in Seville.